Middle-class New Yorkers are getting a state income tax cut, among other benefits. Several new laws effective Jan. 1 will impact family budgets while trying to improve New York State’s business climate. New Yorkers will see another rise in the minimum wage for the working poor as well as a paid family leave option for all workers in 2018 under new laws effective Jan. 1. The minimum wage will continue to rise Jan. 1 reflecting regional differences in costs of living. On Long Island and in Westchester County, the minimum wage rises to $11 per hour from $10. In New York City, the minimum wage for employers with 10 or fewer workers rises to $12, from $10.50; and for employers with 11 or more workers, it will be $13 per hour, up from $11. The rest of the state will see a minimum wage of $10.40, up from $9.70. All workers could secure paid family leave in 2018 to care for a sick relative or to be with a newborn, foster or adopted child. The program will allow eight weeks of paid leave funded through employees’ payroll deductions for workers on the job at least six months. The employee’s job and health insurance will be protected during the leave. The program will be phased in over four years and grow to 12 weeks of paid leave, providing 67 percent of an employee’s wage in 2021. The state laws come as proposed federal laws would cost many middle-class New Yorkers more in taxes under Congress’ plan to limit or end the deductibility of state and local taxes. Washington also plans cuts to the Medicaid and Medicare health care programs. “Given the damaging and destructive tax and budget policies coming out of Washington that seem to target poor and working class families, it’s good to know that our state has some countermeasures in place that actually help struggling New Yorkers,” said Ron Deutsch of the Fiscal Policy Institute, a labor-backed group that lobbies for the working poor. Middle class New Yorkers will enjoy a state income tax cut, the third year of property tax relief, and an expanded child care credit among laws effective Jan. 1. About 4.4 million New Yorkers will benefit from the first year of a middle-class tax cut, which was approved by the Legislature two years ago. When fully phased in, qualified New Yorkers will pay $4.2 billion less in state taxes. Couples filing jointly will see their state income tax rates drop. Taxpayers making $40,000 to $150,000 a year will see their rate drop from 6.45 percent to 5.5 percent. Couples making $150,000 to $300,000 will see a drop from 6.65 percent to 6 percent, according to the state Division of Budget. The third year of a property tax relief credit will mean an average rebate check of $380 for property owners statewide. Eligible taxpayers must have already qualified for a STAR property tax rebate and earn less than $275,000 a year. Lower-income filers will receive a proportionally greater tax break. While politically popular, the property tax relief programs have drawn fire from several fiscal analysts. The state’s Child and Dependent Care Credit will be extended beyond the working poor to households making between $50,000 and $150,000 a year. The current top amount provided to cover child care expenses also rises to $9,000, from $6,000, for families with as many as five children. The amount of tax break will vary depending on the number of children in the family. New York’s employers will soon see a savings in workers’ compensation costs, while employees will see some greater protections under laws taking effect Jan. 1. The workers’ compensation measure is expected to save taxpayers by reducing the rates for local and state governments in the fund that provides financial help to injured employees while they are out of work. The business bills also increase transparency into Gov. Andrew M. Cuomo’s economic development programs that will require annual, public reports for tax breaks given to employers to retain and grow jobs. Cuomo’s “Buffalo Billion” economic development project is the subject of a federal investigation involving developers who received state tax break and incentives and who also are major contributors to Cuomo’s campaigns. Cuomo has not been accused of wrongdoing. 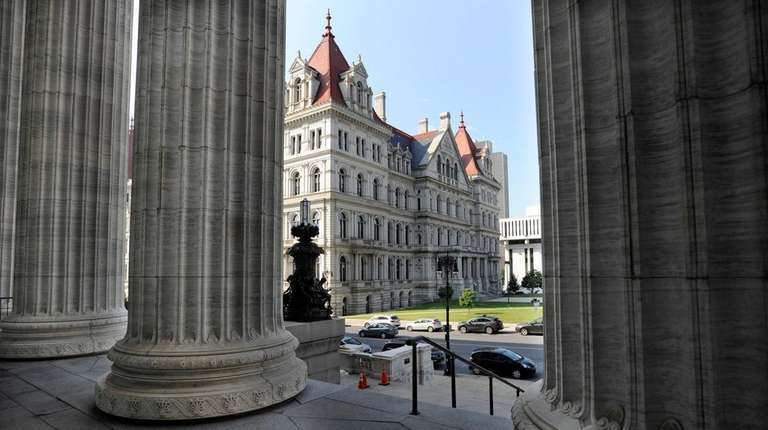 “Reinvent Albany advocates for transparency, and we are glad to see the new laws expanding what is included in the State Register online and the Annual Economic Development Report,” said John Kaehny of the good-government group. Other measures will end an agriculture tax that will save agricultural cooperatives $600,000 a year statewide and provide financial incentives to help grow life science research and development as well as increase the use of alternative energy including micro-hydroelectric energy systems and fuel cell electric generating systems. Another new law will streamline the state’s regulatory process to help businesses comply with environmental and other regulations in regular, public reports. This regulatory or rule-making process details how laws and regulations will be enacted. Some employees who are exempt from overtime, such as managers, will also see their pay rise. Their minimum salary will rise to $825 a week, from $750. Those workers, as well as those classified as administrative employees, like some administrative assistants, don’t have to be paid overtime when they work more than 40 hours a week, but must be guaranteed a minimum salary. The federal minimum salary, which the state’s supersedes, remains $455 a week.